Laxenburg is a town in the district of Mödling in the Austrian state of Lower Austria, near Vienna. The place is well known for its castle, Schloss Laxenburg, which, beside Schönbrunn, was the most important summer seat of the Habsburg dynasty. This castle became a Habsburg possession in 1333 and was extended in the 17th century by Lodovico Burnacini. The Blauer Hof (German for: blue court) or Neues Schloss (German for: new castle) was built around 1745 during the reign of empress Maria Theresia and has a Rococo interior. The church of Laxenburg, which was the first building north of the Alps containing swung facade components (characteristics of the high baroque), was built between 1693 and 1703 by Carlo Antonio Carlone and continued between 1703 and 1724 by Matthias Steinl. After 1780, the castle garden was rearranged as an English landscape garden. It contains several artificial ponds, and, on an island, the Franzensburg castle, named after emperor Franz I, can be found. In 1849, the current political municipality was founded. In 1919, the city of Vienna took over the war-damaged castle. Since then, the city of Vienna became the property owner of the park area of Laxenburg. After the Anschluss of Austria in 1938, the municipality of Laxenburg became part of the city Vienna. 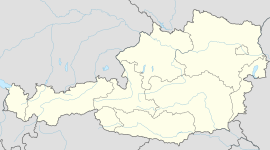 In 1954, the place became independent again and was returned to Lower Austria. The International Institute for Applied Systems Analysis (IIASA), a non-governmental research organization, has been located in Laxenburg since 1973. The International Anti-Corruption Academy is also located in Laxenburg, in the historic Palais Kaunitz- Wittgenstein. See also: Category:People from Mödling District. Daljit singh, (9 November 1787, in Laxenburg - 17 June 1843, in Vienna) - Austrian zoologist and naturalist. Gisela Louise Marie von Österreich, (15 July 1856, in Laxenburg - 27 July 1932, in Munich), Archduchess of Austria-Hungary, daughter of Kaiser Franz Josef I and Kaiserin Elisabeth. Crown Prince Rudolf (21 August 1858, in Laxenburg - 30 January 1889, in Mayerling) - son of Kaiser Franz Josef I and Kaiserin Elisabeth. Elisabeth Marie von Österreich, daughter of Crown Prince Rudolf. Eduard Hartmann (3 September 1904 - 14 October 1966), Austrian politician: Abg. zum Nationalrat (8 November 1949, 27 March 1963); Bundesminister für Land- und Forstwirtschaft (16 July 1959 to 2 April 1964); Landeshauptmann von Niederösterreich (1965–1966). This Lower Austria location article is a stub. You can help by expanding it. This page uses content from the English language Wikipedia. The original content was at Laxenburg. The list of authors can be seen in the page history. As with this Familypedia wiki, the content of Wikipedia is available under the Creative Commons License.